You know what you get a new dress or pair of shoes and you cannot wait to wear them out? You basically make plans just so you have an excuse to wear your new stuff out and about. That is how I feel right now about my new cookware. The moment it arrived, I went nuts-o in the kitchen trying to whip something up ASAP. When Jord and I first moved into our apartment we just used leftover cookware from my grandmother’s home and then picked up random pots and pans here and there from stores when we needed it. We did expect that cookware would play such a big role in my life and job and looking back we probably should have done some research on what kind we should be using. 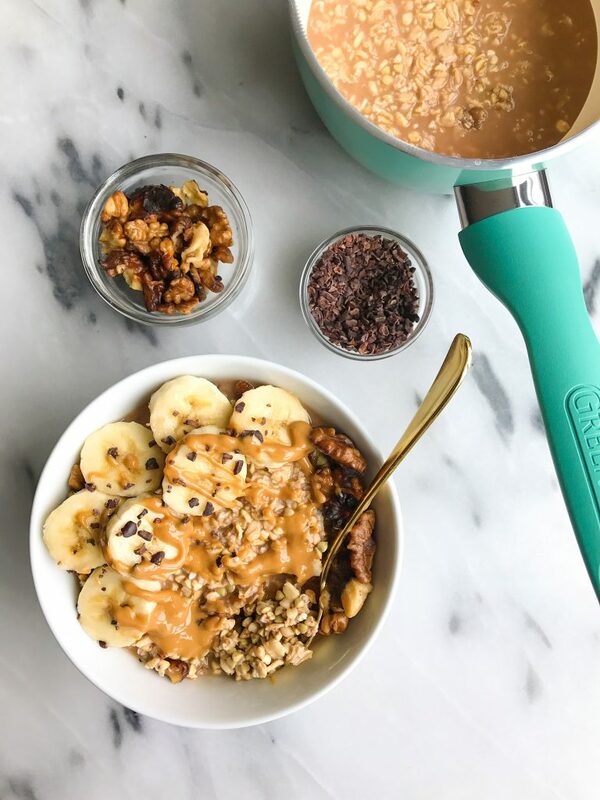 I recently began cooking with ceramic-coated cookware from GreenPan. I was a little apprehensive at first that I would break the ceramic cookware or it would be too heavy, but ever since that box of cookware arrived, I haven’t even touched my old set. And the best part? It is non-toxic. At this point most of us pay attention to the foods we eat and how we nourish our bodies. But not many of us pay attention to the tools we use to cook those foods at home. Our cookware is just as important as buying organic apples versus non-organic apples. Or grass-fed beef versus not. Healthy cooking starts with healthy cookware friends. Most non-stick cookware are made of chemical components like PTFE and PFOA and they release TOXIC chemicals onto our food. How gross?! Here I was thinking that I was saving myself time and effort by using non-stick pans and meanwhile, I have been contaminating my food. On the other hand, ceramic non-stick coatings are made from all natural materials like sand. They work even better than traditional non-stick pans too and they are high heat resistant. No toxins will end up in your food even at high cook temperatures. I recently started using GreenPan who is the first cookware company with ceramic non-stick cookware in the market. The OG if you will. They have been around for 10 years now and are celebrating their 10 year anniversary right now. And I seriously notice a difference when I am cooking. Food comes off SO much easier and nothing gets stuck to the pan. Plus they are so easy to clean and you don’t need to scrub like you usually do with your cookware. I have the Rio Cookware Set from GreenPan and absolutely love it. It is a 12-piece set with fry pans, sauce pans, etc. Like I said, I haven’t even used my old toxic cookware since getting it and I really don’t plan to go back. It is so easy to clean, it is super light and I am actually doing myself a favor by using it. 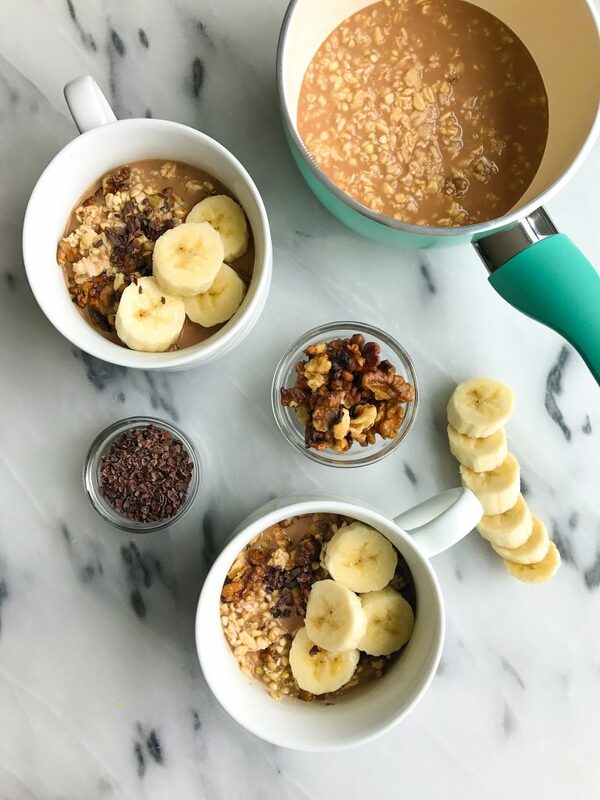 The first recipe I made in my GreenPan cookware was this bowl of Chocolate Maca Overnight Soaked Porridge. 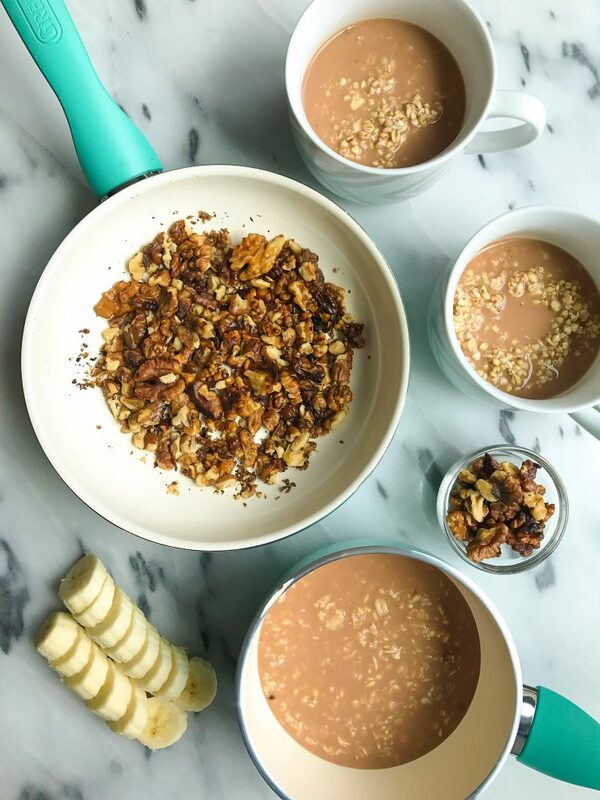 The most nourishing and delicious chocolate-y breakfast. 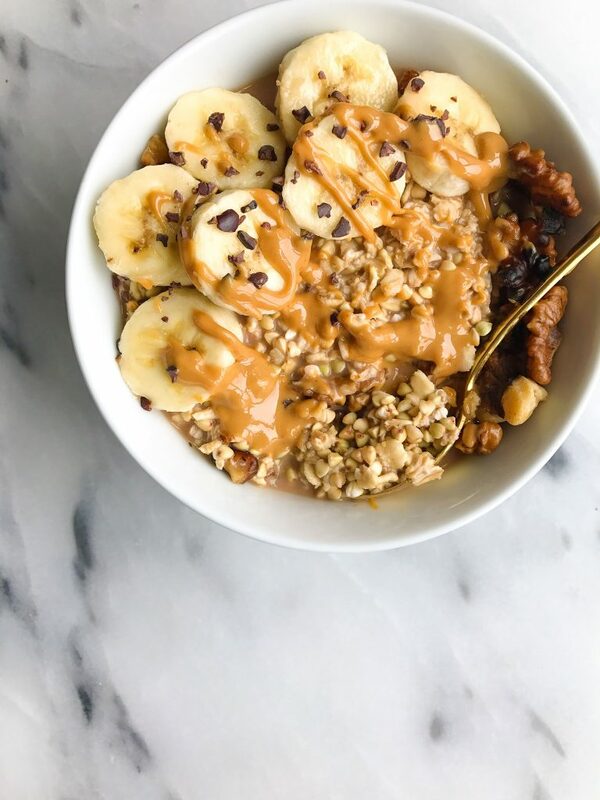 Plus it has a boost of maca and some sweet toasted nuts for an extra crunch. Thank you GreenPan for sponsoring this post. It means so much to me to work with brands that I love and who support rachLmansfield! YUMMY! It looks so good and so perfect for a cozy morning. And I’ve never seen those Green Pans before, but they sound like a really great non stick option. Buckwheat oats are the best! Mornings are busy around our house, so overnight oats/porridge make me so happy! I love knowing that I have breakfast pretty much DONE in the fridge.